Just had a week at this lovely hotel in Benidorm. Staff very nice and helpful. Cleanliness of the hotel and rooms are second to none. Food pretty good for a 3 star hotel. I would return to this hotel without a doubt the next time in Benidorm. Entertainment was a little disappointing, but lots going on in the resort to make everybody happy. Great for singles, couples and families. Very well appointed rooms for a 3 star with large bed, one of the best beds I've slept in at any hotel I've stayed in. Arrived Easter Saturday for 7 nights. Room clean and well equipped, bathroom ditto. Public areas well kept, clean and tidy. Overall, a well run, clean and pleasant hotel. Food was not so good. Breakfast - eggs are fried and kept in bains marie to go solid. Cheeses and cooked meats good at breakfast. Evening dinner is a lottery, with three mains offered of variable quality. It seems a pity with so much excellent fresh produce around at low prices that it isn't reflected in the hotel buffet. Location is good, quiet and overlooking the park. If you have problems with hills/inclines it could be hard work walking back from town or beach. Our second stay at Princes Park.I emailed the hotel a few days before requesting a room with a view of the park, I got an instant reply saying that they would. On arrival they gave us our key and said if the room wasn`t what we wanted to come straight back down and they would give us another. The room was perfect, it had a large corner balcony, an excellent view and was on the first floor. Again we couldn`t fault the cleanliness of the hotel. The food was very good. Breakfast was ok again (we took our own coffee to use at breakfast) In fact we missed breakfast as we enjoyed the lunches more and 3 meals a day is alot.A soup or a stew at each meal. Lots of salad , chips, potatoes and a bit more veg than I expected, sprouts a few time (must be because it was christmas)I am fussy with meat but I never struggled once. Paella at lunchtime.They even had steak pie a couple of time and a chicken pie one day. Desserts were better than last time always icecream, fruit and cake and a hot pudding each evening. Wine still 3.5 euros a bottle. Christmas day lunch was very good. We were shown to our tables and drinks were included. The waiters were very attentive. We throughly enjoyed our lunch. There was turkey but it wasn`t a tradtional english christmas dinner, if your looking for this then it may not be for you. Location for us is perfect but maybe a bit far out for thoose looking for the show bars. We don`t stay in for entertainment but heard it was dancing. If your looking for the Spainish side of Benidorm this hotel fits the bill but may not be suitable for the less mobile, there is a good bus service 50 meters away. I read lots of reviews before I travelled and I was very pleased with our stay at the Prince Park .The hotel is kept clean, it is a little dated in places but not unapealing.Strict code about not saving sunbeds which worked great as you could get a sunbed at anytime of the day.Fridge hire 1.5 euros per day, Safe 1.8 euros per day.Rooms cleaned everyday. The choice at meal times was very good,english breakfast wasn`t the best as sometimes it wasn`t warm enough but everything else was. Choice at lunch and dinner was very good, I am a bit fussy with meat but I always had a good choice. Paella each lunchtime. Puddings were typicaly Spainish, fruit, fluffs, cake, yogurts and a great icecream machine.Wine 3.5 euros a bottle. Drinks by the pool were not as good value. We found if we had our evening meal early we bet the rush as it could get busy in the dinning room. word of waring don`t go late as they will be clearing away, they can be a bit rude rude rushing you out. Situated at the top of the park. 10 mins walk to the train station. 15 mins to Poniente/Levante.We chose this hotel as we like to spend most of our time around the old town. Bus 12 to ricon, 1 & 41 to Dove park, Cala Finestrat, Terra Mitica, Terra Natura.Lots of shops and bars within a 5 min walk. Would visit this hotel again, meals were very nice. I liked the idea that sunbeds were not reserved. I also got an excellent view of the park and the sea in the distance. When we were dropped off by bus my initial thought was "we are not going to be near anything" however that was not the case. Walk to the promenade and main area was about 15minutes. dated. Our rooms were spotless cleaners in everyday. We did not have a great view as our room was at front of hotel which looked on to the back of a small hospital however, we did get the sun on our balcony all morning so that was a plus, the rooms at back had a nice view. Not great selection of choice of food. Breakfast ok but dinner could be a nightmare very repeatative and bland. The house wine was very good however at 3 euros a bottle. There are lots of nice restaurants near by so you can always eat out. Entertainment in hotel was fine always a cabaret act everynight and dancing. It was however geared more for Spanish and Belgiun guests compare didn't speak much English. We got this holiday as a late deal with Globespan,really low price, so we couldn't really complain. If we got the same offer again I would got back to hotel but would not pay full price to go there. return in March don't know if it would be our cup of tea height of season. Lots to do you would never be bored there. Prince Park. Rooms large and very clean with lots of storage space. Maids cleaned and changed towels everyday. Views over the auditorium are awesome. Hotel is immaculately clean, staff helpful with 24 hour reception and security gaurds. Entertainment geared for the elderly but was pleasant to watch before we went to the clubs. Great for couples and groups over 40 years old but not recommended for families. Would go back again tomorrow. 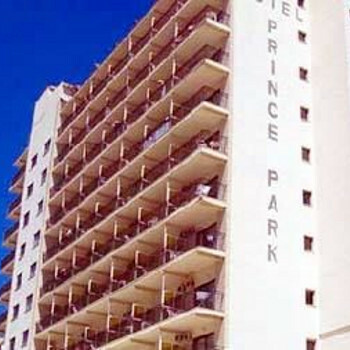 Just got back from Benidorm staying at the Prince Park. The hotel was lovely and clean. Rooms cleanned daily, hotel was quite on a night. Staff changed uniforms every food sitting. Although food wasn,t aimed at English people and there wasn't much choice and no choice for the children, what choice they did have was of good standard. The staff in the dining area worked hard but could do with smiling a little and not standing in the way of guests trying to get to there table with food.tables were cleared instantly. I only saw 1 entertainer and wasn,t worth watching. The staff in reception all spoke english althought on a night it was the security guards on but you were only asking for your keys. The pool is a little small but ok and no good if you worship the sun ( I dont) so was great, as it is very shaded and you have to follow it around until about 3.30pm, there were plenty of beds, friends came out the second week and we splashed and messed about in the pool and everyone just laughted. Its not a bad location if you dont mind walking, 10 mins from the centre of the old town and 25 mins to the new. we walked down and got a taxi back costing between 5 and 5.50 euros. If a group of stag or hens are going I would say stop in the new town where most of the show bars are and the fun pubs. Overall it was a fantastic holiday and I would stay here again, although not for a weekend. Hotel was clean. Rooms have loads of room and not cramped. The food was aimed at the foreign visitors with no selection for children at all, we spent a small fortune having to eat out. Location was a good 20-25 min walk to centre of the town and beach. The hotel staff were not that helpful to those who could not speak Spanish. Entertainment was not worth watching. Pool was taken over by the elderly who did not want to get splashed. My kids went in the pool once. I was told this was a family hotel. If you are British under 50 like your grub and like to have a laugh on holiday do not book this hotel it is not a family hotel. We paid an extra 300+ euros to move hotels on the second day. We moved to Hotel Pueblo now that was a fantastic hotel with ample choice of food and loads of entertainment & only 1 min walk to the pubs clubs and bars. Fantastic. We were there for the celtic convention and feared the worst after reading the reports,this hotel was superb, very quiet and clean. The food was great and the staff very nice and polite. A 10 minute walk downhill to the new town and 5 to the old town so location was ideal, 5 euros for a taxi back from the square in the new town,there are 2 security guards at the door after midnight.